A flawless reproduction of Hans Wegner’s iconic Wishbone chair – a Scandinavian mid-century masterpiece for your own home. When it first started taking shape, Scandinavian design was a game-changer for the furniture industry. Anticipating the decline of massive, dark and pricy baroque-style furniture, a new generation of designers and architects pioneered a bold new style that aimed to fuse comfort, functionality and style, while ensuring the affordability of the end result. This democratization of the market, led by big names of furniture design was perfectly embodied in Hans Wegner’s iconic Wishbone chair, also known as Y Chair. With its sleek and organic form and natural wooden look, CH24 left a lasting mark on furniture industry, revolutionizing our very idea of a dining chair. The timeless style and elegance of this icon of Danish mid-century design are sure to give a unique sophisticated touch to every room and make your interior design efforts really noticed. Wishbone chair has become almost synonymous with mid-century era and its unique aesthetics. Designed back in 1949 for the manufacturer Carl Hansen, this icon of Danish design is still as stylish and elegant as it was more than half a century ago when it first appeared on the modern markets. To this day, Y chair remains one of the most famous of all of Wegner’s designs. The legacy of this era, exemplified by Hans J. Wegner’s Wishbone chair, still shapes the design practices to this day. Inspired by Wegner’s iconic design, we embarked on a journey of recreating this classic, taking up the challenge of following in Wegner’s footsteps in terms of manufacturing techniques, material selection, dimensions and all the way down to the smallest details. The result is an impeccable reproduction of the iconic Wishbone chair, one that is rooted in the same design philosophy while also ticking all the right boxes for the 21st century consumer. An ideal stylistic addition to your dining room, Wishbone chair can add a completely new layer of visual interest around your coffee tables or a dining table, while at the same time providing you with unprecedented comfort which is bound to leave a lasting impression. 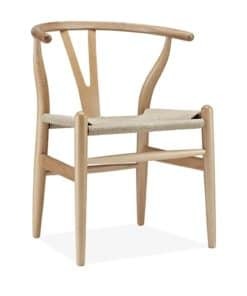 By staying true to the Danish design philosophy that gave birth to Hans Wegner’s most iconic piece, we ensured that our dining chairs in Scandinavian style embody all the same qualities. By fusing cutting edge industrial processes with traditional craftsmanship we managed to preserve the natural texture and feel of solid wood and emphasize the elegant and organic flow of lines while still keeping the production costs at the minimum, thus ensuring the affordability and low price of our Wishbone chair reproductions. The same approach is used in production of many other Wegner designs, like the CH25 Easy chair in natural materials, which is yet another example of the Danish designer’s love for wood and woven patterns. At the same time, our relentless search for impeccable quality led us back to the fine art of carpentry and joinery. By employing the same manufacturing techniques that Wegner developed specifically for the production of the Wishbone chair, our skilled team of craftsmen will make sure that the quality of the final product matches the furniture of the highest class. All the bent parts of this icon of Danish design are produced in one piece, without taking a shortcut with a steam box – instead, carefully selected pieces of finest quality solid wood are completely submerged in a special hot solution for carefully monitored period of time. This crucial step overlooked by many manufacturers of Wishbone chair reproductions ensures that the wood can be easily bent into perfect shape without compromising the structural integrity of the piece. The same attention is given to the hand-woven paper cord seat, produced by specially trained traditional craftsmen out of as much as 400ft of paper cord. The unique properties of this material paired with a carefully thought out weaving pattern will ensure comfort that can easily match even the most comfortable lounge chairs out there. All the materials used for the production of our Wishbone chair reproduction are carefully sourced to ensure premium quality that will last for decades to come. The impact Scandinavian mid-century design had on dining chairs and our view of furniture and interior design in general is nothing short of revolutionary. And at the core of this immense success is unwavering pursuit of ever-greater democratization of the market on numerous levels. On one hand, Scandinavian and especially Danish designers created for the common man, and for the large masses, bridging the historic gap between style and cost – the same is true for Wishbone chair. By introducing state of the art design of impeccable elegance and style to the home of an ordinary person, Scandinavian designers made a strong statement that continues to inspire – great design should be accessible to all and not just the privileged few. The timeless style and elegance embodied in the seemingly simple minimalistic aesthetic allow the iconic Wishbone chair to perfectly fit in with countless contemporary interior design styles. As such, our perfect reproduction is sure to bring a unique classic touch to your modern home and catch some well-deserved attention! This perfect compatibility with numerous stylistic tastes and preferences is an important factor contributing to the unwavering popularity of Wegner’s Wishbone chair. With natural materials, simple, clear, yet flowing and organic lines, low cost and perfect comfort, we stayed true to the core principles of the philosophy of Scandinavian design and the characteristic appeal of Danish modern. Our dining chairs certainly draw inspiration from Hans Wegner, but they also provide an original answer to the challenges of furniture design in the 21st century with state of the art manufacture and design processes involved in the recreation of this iconic piece. Our Wishbone chair premium reproductions come in a variety of different colors and types of wood so you can easily find the model that perfectly fits in your stylish home and contributes to your unique stylistic expression. Of course, the natural appeal of wood strongly contributes to the overall aesthetic of this iconic dining chair, so uncolored models are still more commonly sought-after than the colored ones. The light and subtle beech, sturdy oak rich in character, or finest ash with a lovely rustic expression are perfect for those homes which aim to achieve that typical Scandinavian style. However, if you are looking for a more modern solution, our white Wishbone chairs or black Wishbone chairs (with colored or natural seat) might catch your attention, alongside brown models which blend the texture of wood with the artificial color. The light weight and exceptional comfort of our Wishbone chair premium reproductions are perfectly complemented by their stylistic versatility. While this classic dining chair from the mid-century era will certainly be at home in rooms decorated in Scandinavian style, it can easily fit in many other interior design styles with just a bit of imagination. For example, if you are a fan of boho chic, why not add some colorful and vibrant cushions to your Wishbone chair? Or go for a simple full-black or full-white Wishbone chair model for a room in typical minimalist style? On top of that, Wegner’s Wishbone chair can be used as a dining chair, but due to its amazing stylistic expression and sculptural appearance, it can just as well be used as an accent chair. So, why not use two of them in a dining set with less expressive models? Or maybe put a couple around your stylish round coffee table? On top of all this, Wishbone chair is rather easy to maintain, although it is important to avoid stains, especially those that are rather persistent, like from coffee or red wine. Most spills, however, can be easily removed using oak soap or any other non-invasive wood cleaning detergent. And for additional shine, you can always use some oil intended for wood polishing. Despite its sculptural appearance and rich character, Hans J. Wegener’s Wishbone chair can be easily combined with other models and décor elements for a truly unique aesthetical expression. With its aforementioned versatility in mind, we would especially mention how stylish it can look when in company of other models from Wegner’s amazing opus. As mentioned, it can be an accent chair around the dining table, but can also add a unique classic and maybe a bit rustic touch to a stylish lounge when placed alongside leather armchairs from the same era. To make it really impactful on the space, you can use a whole set, but just as impressive results can be achieved with just a couple of cleverly positioned Wishbone chairs. They can look amazing with or without any cushions, depending on whether it matches your décor, while they can easily shine when combined with a rug that will add a bit of contrast to the room.